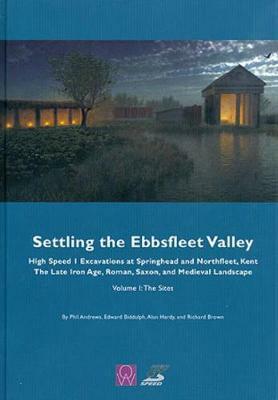 The Ebbsfleet Valley in north-west Kent is just 2.5 km long, with Springhead at its head and Northfleet near its confluence with the Thames, and contains many important sites of many periods. Construction of the Channel Tunnel Rail Link provided a unique opportunity to undertake large-scale investigations of Late Iron Age and Roman settlements, religious complexes, cemeteries, roads, a "processional way" and a villa site, as well as three small Saxon settlements, two cemeteries and a watermill. The results are published in four separate volumes. This volume describes the archaeological results of the excavations. A Roman "small town" or roadside settlement (Vagniacis) developed into an almost unique religious centre within Roman Britain, probably attracting pilgrims from throughout the Empire. In addition to temples, a major mid-2nd century AD sanctuary complex has been discovered, focused on the springs. Another temple close to Watling Street may have remained in use until the late 4th or early 5th centuries while a range of timber buildings lay within properties lining the road including an aisled barn, a blacksmith's forge, a bakery and a brewing complex. Three small cemeteries were recorded. At Northfleet villa, the waterfront and much of the agricultural surroundings were investigated. A detached bath-house and a multi-phased timber barn, the latter representing part of a brewing complex, were excavated. Also excavated were sunken-featured buildings belonging to possibly three separate Saxon settlements and two cemeteries and the waterlogged remains of a Saxon watermill.